Hungarian riot police fight with migrants at the border crossing with Serbia in Roszke, Hungary, Sept. 16, 2015. U.N. chief Ban Ki-moon denounced Hungary's treatment of migrants as unacceptable Wednesday, after police fired tear gas and sprayed water cannon at hundreds of asylum-seekers on the country's border with Serbia. "I was shocked to see how these refugees and migrants were treated," Ban said. "It is not acceptable." The U.N. secretary-general said the migrants "were people fleeing war and persecution" and that "they must be treated with human dignity." Serbian Prime Minister Aleksandar Vucic condemned what he said was Hungary's "brutal treatment" of the migrants fleeing war-torn Syria and other Middle East countries. Police clashed for hours with the migrants after blocking one of the biggest entry points into the European Union. In the first case involving Hungary's tough new anti-migrant laws, a court Wednesday convicted an Iraqi man of illegally crossing the border fence with Serbia the day before, ordered him expelled and excluded him from Hungary for a year. Croatian Prime Minister Zoran Milanovic criticized Hungary's actions and said his country is prepared for the influx of migrants fleeing Syria and other war-torn Middle East countries. "We are ready to accept - and, if you will, direct - those people regardless of their religion and the color of their skin," Milanovic said. "We are ready to direct them to the destinations they obviously want to reach with a keen desire in their hearts: Germany, Scandinavia, those several countries." As the migrants walked into Croatia from Serbia's western border, authorities urgently dispatched de-mining experts to the border to mark minefields left from the Balkan wars of the 1990s. Migrants stand in front of a barrier at the border with Hungary near the village of Horgos, Serbia, Sept. 16, 2015. Hungary defended its border closing, saying it was protecting its territory against the influx of migrants looking for better economic opportunities, not fleeing persecution in their homelands. 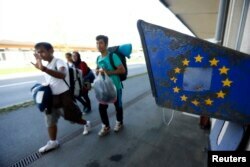 Still more migrants sought entry to the EU elsewhere, walking from Salzburg, Austria, into Germany, or through Lithuania on their way to Scandinavian countries. Syrian President Bashar al-Assad blamed Europe for its biggest mass of migrants since World War II. He accused European of supporting Syrian "terrorists" - his term for several groups trying to overthrow his regime. "If you are worried about them [the refugees], stop supporting terrorists," Assad told Russian media. Migrants pass near a phone booth as they cross the border on feet from Austria to Freilassing, Germany Sept. 16, 2015. While welcoming several hundred thousand refugees, German Chancellor Angela Merkel's Cabinet called for expansion of the country's naval operations in the Mediterranean, to block human traffickers from ferrying more migrants from Libya and elsewhere in rickety, overcrowded boats to the shores of Greece and Italy. 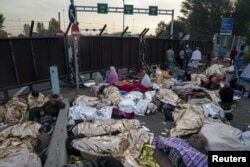 The Hungarian government said Wednesday that 366 illegal entrants were detained Tuesday, the first day of operation for Hungary's strict new laws punishing people who enter the country illegally. On Monday, police said, a record 9,380 migrants crossed into Hungary. Migrants sleep on a highway in front of a barrier at the border with Hungary near the village of Horgos, Serbia, Sept. 16, 2015. On Tuesday, Serbia said it is not able to handle the vast number of migrants gathering along its borders while Hungary turns them away. Migrants wash themselves after gathering in Edirne on the way to the Turkey-Greece border on Sept.16, 2015. In Berlin, Chancellor Merkel called for a special summit to address the migrant crisis and urged European solidarity. At a White House meeting with Spain's King Felipe, President Barack Obama said the entire world has to pitch in to help the migrants. "We agreed that this is going to require cooperation with all the European countries and the United States and the international community in order to ensure that people are safe, that they are treated with shared humanity and that we also may have to deal with the source of the problem, which is the ongoing crisis in Syria," Obama said. The American leader said he told the king it is important that the U.S. also take its share of Syrian refugees.